You’re sitting in a teaching interview. Question after question comes your way, and you nail it! You’re feeling good about things. Then, you get to the end of the interview and the interviewer asks if you have any questions for them. Uh-oh! What should you say? 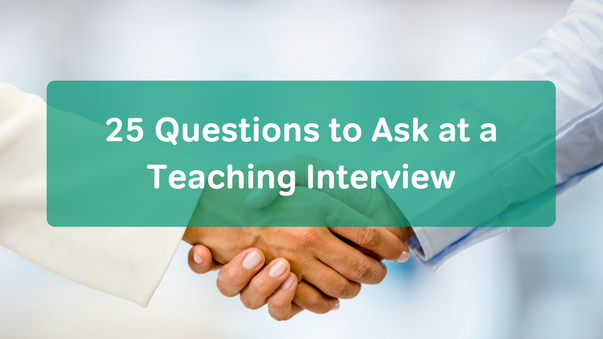 Be prepared by asking any of the following 25 questions to ask at a teaching interview. Is there a set curriculum? Do teachers have an input in the curriculum that they teach? Can I incorporate my own materials and lesson ideas in the classroom? What resources does the school provide to help teachers? What technology is available in a standard classroom for teachers to use? Do you have a teacher-mentor program for new teachers? What opportunities do you offer for professional development and growth? What kinds of staff development opportunities do you offer? Do you encourage teachers to pursue a graduate degree? How does the school district support teachers who pursue a graduate degree? How does the administration support teachers to fulfill the mission statement of the school? How many teachers stay long enough to become tenured at the school? What are your favorite things about the school? What are your favorite things about the school district? Are there any major issues that the school is addressing this year? What are the district’s crucial issues this year? How does the school district stand out from other districts in the state? Where do you want this school (or district) to be in 5 years? What are the average class sizes in the school? What is the teacher-student ratio? What is the school’s perspective on discipline? Is there great community support for education? What is the school and district policy on homework? What extracurricular activities are available for teacher participation? Are there any extra assignments that teachers are required to do, such as lunch duty? What qualities, skills, and personality would your ideal candidate have? What are your expectations for a teacher who wants to be a long-term employee? You don’t want to bombard the interviewers with questions. However, choose a few that are the most interesting to you. If the question doesn’t get answered in the course of the interview, make sure to ask it at the end.